Clarets midfielder Steven Hewitt has joined Southport on a one-month emergency loan, subject to paperwork. Hewitt joins the Vanarama Conference side until the end of their season on April 26. The 21-year-old has made two substitute appearances for the Clarets, making his debut in April 2012 before starting his first game for the club in a 1-1 Capital One Cup draw against Plymouth Argyle in August of that year, where he scored in the penalty shoot-out. 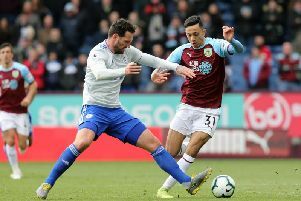 Hewitt has been involved with the Clarets’ first team just once this season, as an unused substitute at Leicester City in October. And the combative midfielder - who played 15 games, scoring once for Alfreton in a loan move in 2013 - is looking forward to linking up with the Sandgrounders. He said: “I am looking forward to playing some competitive football where you are playing for points. “I have been hoping for a loan move for a while and I have played in the Conference before, so I know what to expect. “It is a decent level and I can’t wait to go and play for Southport. Hewitt will meet up with his new team mates on Friday ahead of their clash against Torquay United on Saturday.